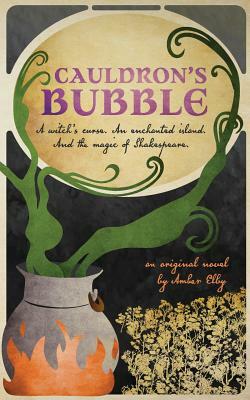 "A magical bubble transports Alda through time and place to a realm of witches and curses, pirates and princes, and the lost worlds of Shakespeare. She, along with a cabin boy called Dreng, must navigate the conflicts and characters of Macbeth, Hamlet, and The Tempest. But will they escape with their lives? Or will they become lost and forgotten?" Imagine that Shakespeare's characters could interact off-stage and that their adventures could span beyond the bounds of the Bard's fiction: Hamlet deviously escapes from the pirates who capture him on the way to England; Macbeth's witches perform their magic on unsuspecting victims; and a summoner awakes from the shadowy backstory of The Tempest, bent on revenge against those who stole her island. These stories and more come to life in Cauldron's Bubble as readers follow two new protagonists, an orphan named Alda and a cabin boy called Dreng, as they each search for something lost. The novel alternates between their limited perspectives (third person) as Alda discovers a magical bubble that transports her to Macbeth's witches on the moor. Dreng, meanwhile, helps Prince Hamlet escape from pirates en route to England. The two protagonists come together on Prospero's enchanted island, where Alda is on a quest to free Ariel, and Dreng is smitten with the mysterious Miranda. Ultimately, Alda must find power she gained in a forgotten realm called Netherfeld to defeat a powerful summoner, and Dreng must awake to the realities around him before he is consumed by magic. *The sequel, entitled Double Double Toil, will be released on October 1, 2018.